Product setup (stock) including prices, multi-tier prices, compound items (products with sub items), variants, categories and departments. To update a specific branch, select the branch in the Branch Module and click on 'Update Branches' > 'Update Selected Branch'. To update all branches, in the Branch Module click on 'Update Branches' > 'Update All Branches'. If you are updating a specific branch the name will be displayed, otherwise the number of branches that will be updated will be displayed. A list of products that will be updated will be listed. If you are updating multiple branches the products for each branch will be listed. Note that a specific product might not be rolled out to all branches as it will depend on your selection. You can choose to add all products to the update. With this option you can choose specific products that should be updated. The 'Add New Products' option will not add the same products for all the branches. It will look when last each branch was updated and add all the products that was created after that branch was updated from the branch module. It will not include products that was edited in ROBOTILL Manager - only new ones that was created after the last branch update was done for that specific branch. The attributes update is only needed if you change or add new attributes in the attribute setup. It is not needed to do this update if you change the attribute settings per product as these are updated when product updates are done. The print design update only needs to be done if you change print layout. 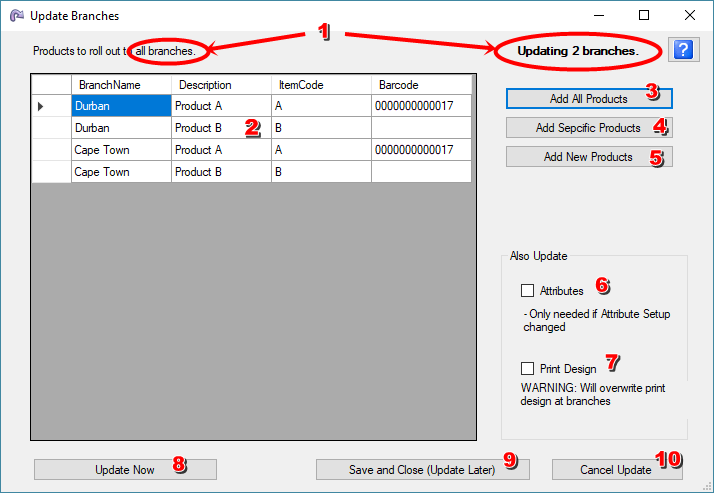 Note that any branch specific changes that were done (for example the shop address) will be lost if you update the branch print design from the branch module. The 'Update Now' will do the update and clear the list. The 'Save and Update Later' will save the selected items for each branch and close the screen so that more items can be added before doing the update. The 'Cancel Update' button will clear the list of selected items and close the screen. New products will be added and existing ones will be updated. Products at the head office are also created in ROBOTILL Manager. The same products does not need to be at each branch as you can choose what products to roll out to specific branches. Each branch can have unique products that is not at the head office or any other branch. These products will not be affected by the update. For a product to show up in the reports at the head office (branch module) the products must also be in the head office system.